Smart offer another TRINET promo called TOTAL20, this time it’s made even more affordable with your P20 you can now have unlimited TRINET texts (Smart, Sun and Talk N Text). Here is more with TOTAL20, aside from Unli TRINET texts you also have a 20 texts to all networks and 20 minutes TRINET calls. This TOTAL 20 promo is available to all Smart Prepaid subscribers. You may continue reading below on how to register and how to call on Smart TOTAL20 promo. 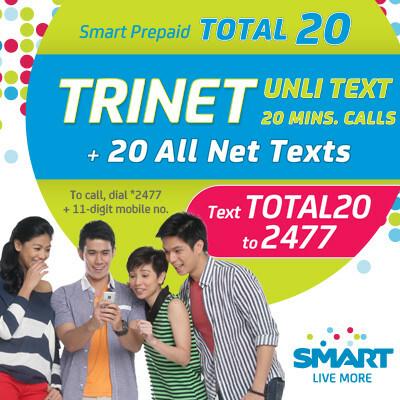 You may also try other Smart Unli Call and Text Promos or visit Smart website for more details and informations about Smart Prepaid TOTAL20 TRINET promo.